There’s a new face on the age-old gun debate: our students, and they won’t be silenced. They are demanding that the adults in power keep them safe and they will not stand by and allow elected officials to fail them any longer. As of Feb. 14, just a month and a half into the new year, a total of 20 people have been killed and more than 30 have been injured in shootings at American elementary, middle, and high schools. Only weeks earlier at Marshall County High School in Kentucky two students were killed by a 15-year old shooter who left fourteen others wounded and all traumatized perhaps for the rest of their lives. . . .
Nationwide, students and activists have joined their rallying cry and have organized two upcoming events — the National School Walkout on March 14 and the March for Our Lives on March 24. 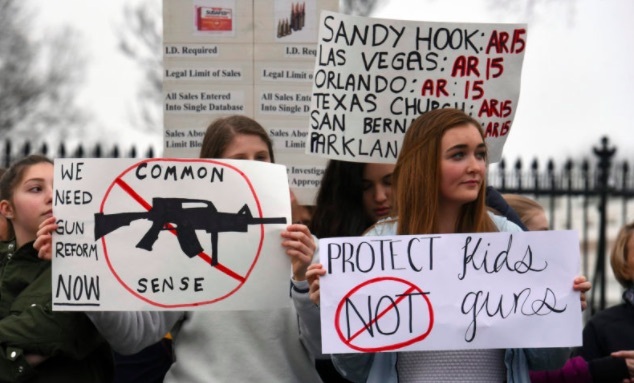 NEA will also participate in another event, a National Day of Action on April 20, the anniversary of the Columbine shooting. Do you think handguns should be banned?, Why or why not? March 14th – the Women’s March has announced a National School Walkout in which school communities will walk out of their schools for 17 minutes to honor the lives lost in Parkland. NEA will join with AFT in encouraging educators throughout the country to wear orange on this day. March 24th – Several students who survived the tragedy at Parkland have called for a student-led march and protest. They will travel to Washington, DC, and meet with politicians on the need to address gun violence and are encouraging others to join. This is a fully student-planned march. More information can be found at marchforourlives.com. April 20 – NEA and its members are joining with the National Public Education Network, American Federation of Teachers, Moms Demand Action, Everytown for Gun Safety, Giffords: Courage to Fight Gun Violence, and other national organizations, to take action against gun violence on April 20 together in a way that sends a strong message to policy makers that #enoughisenough. NEA is asking educators nationwide to share their ideas and information on events in their school communities. Visit our National Day of Action site. Editor’s note: The National Education Association (NEA) and the American Federation of Teachers (AFT) are the largest trade unions of teachers in the United States with 3 million and 1.6 million members respectively. They have consistently opposed NRA demands to arm teachers, and the AFT has once again expressed its opposition in the last few days.